And thus wraps up another TdF. In the past, TdF has been ridiculously productive. Not as much this year, but still productive in getting me moving on a project. A total of 3 completed skeins. Here’s where it sat as of yesterday evening. 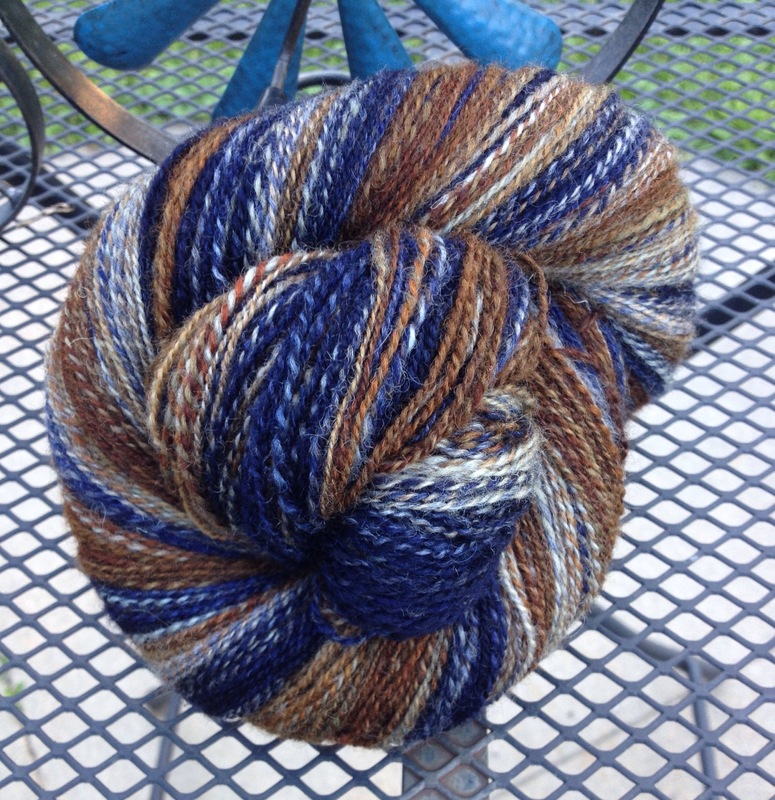 It’s going fast since I am spinning quite a bit thicker, but I had limited time for it yesterday. Instead, we had a group motorbike ride planned. Mr. Ink decided that we needed to lube the chain on my bike. 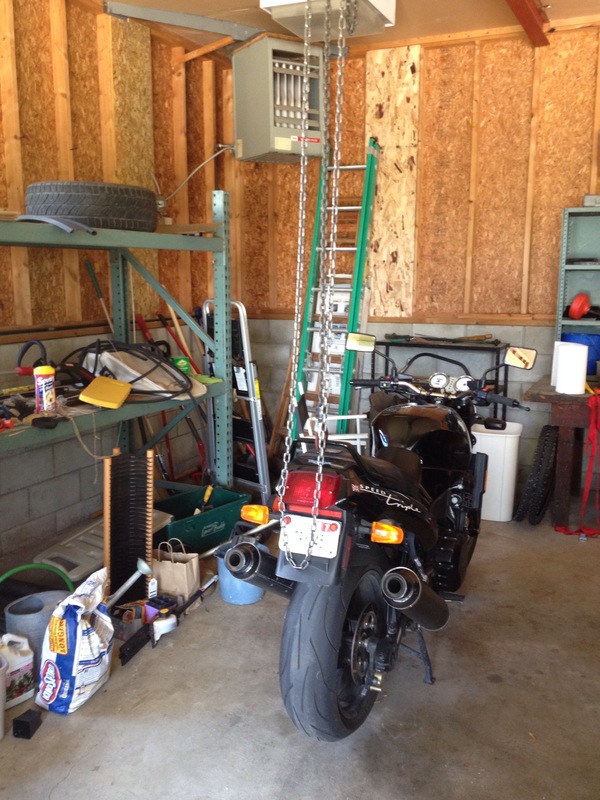 Now, my bike is lowered, and it’s a naked bike so there’s really nothing to grab to put it up on the center stand. We’ve had so many problems with this in the past. Every other bike I’ve worked with slides right onto its center stand with no issues, but this one causes pain, irritation, and foul language while sliding the bike and the stand backwards over the garage floor. I say “Yes. Surely there’s a better way than we have been doing?” And then I pointed out that we had an engine lift in the garage at the new house. Soon after, we had my bike on its center stand with absolutely no issues whatsoever. Unfortunately, Mr. Ink will be changing out the seat on that bike soon, which will mean we will no longer have a convenient handle. On the other hand, he also plans to raise it back up to its appropriate height, so it’s also possible that will help our center stand issue. In any case, this was a real win, especially since it was quite hot and humid yesterday. We then went on a group ride. Surprisingly enough, there were 2 other women riders this time! Pretty much I am the only female on her own motorbike in any group I ride with so this was quite exciting. Even with the high heat and humidity, we stayed pretty comfortable as we were moving along. And we took long rest stops for water in the AC when we had the opportunity. I think I put in 115 miles or so. 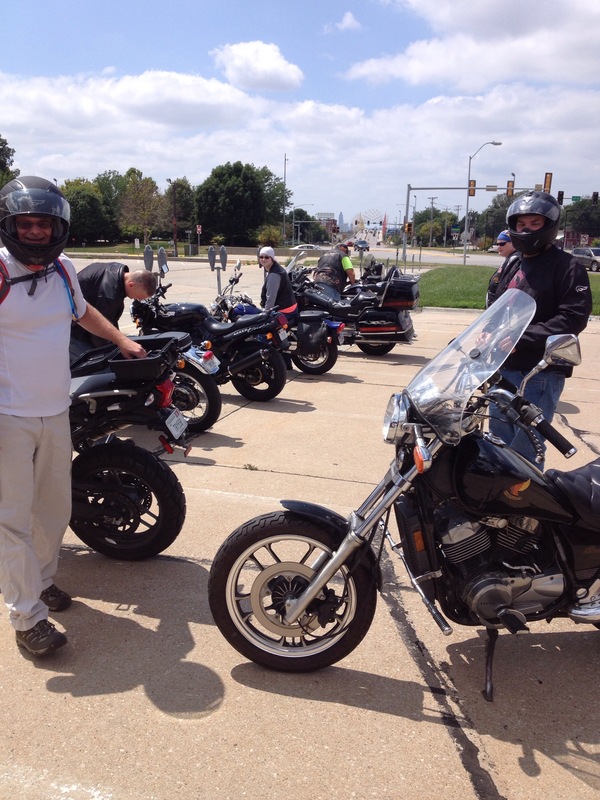 It really was a great group to ride with, and I enjoyed it immensely. About halfway through the ride, I realized I was enjoying it in part because I wasn’t anxious to get back home. And I wasn’t anxious to get back home because we no longer have the second house albatross around our necks. It’s going to be awhile before I quit crowing about that! 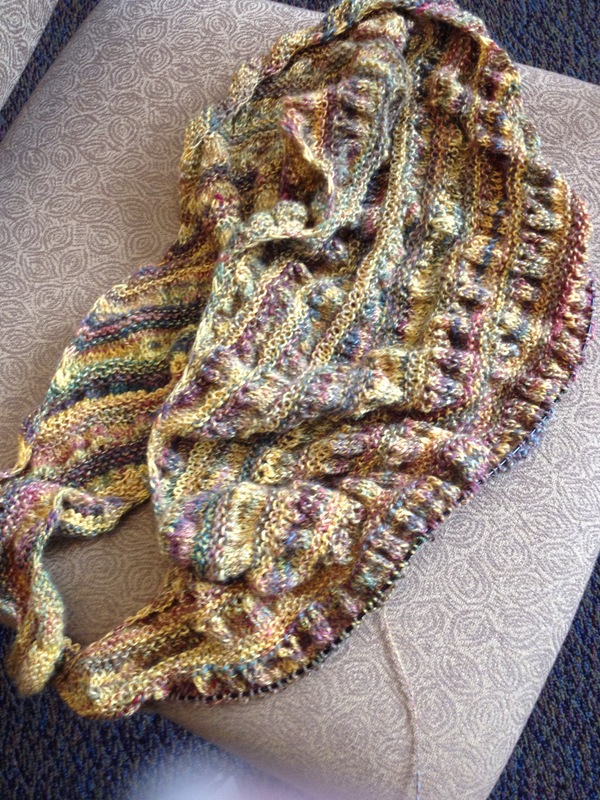 Today….I knit! I took a complete knitting hiatus while TdF was going on. But, I was able to put in about an hour of work on my So I Gathered shawlette today, out of handspun from rolags. It is finally getting quite large, and the ball of yarn seems to be disappearing quickly. I don’t think it’ll be long before I am done with this one. Tonight I’ll wind yarn for my next two projects. I’ll call them my July socks, and they will be two christmas stockings. 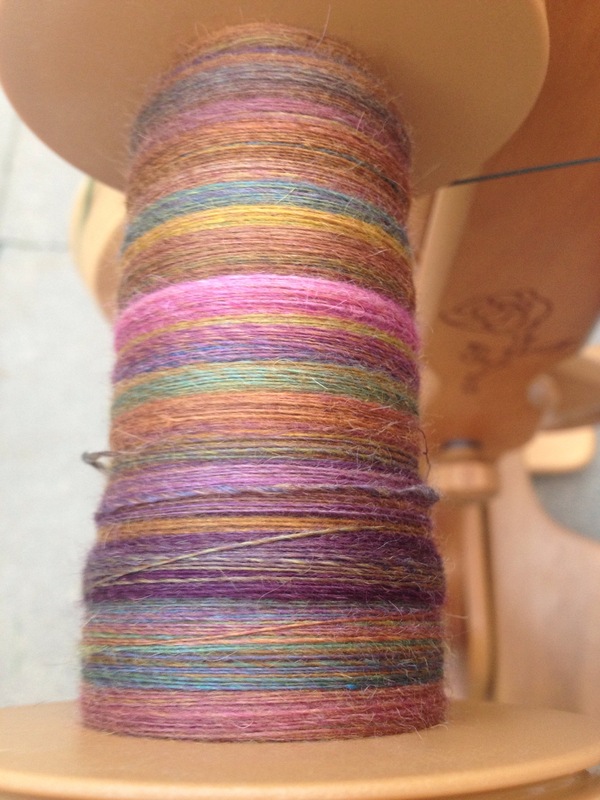 I am not saying I look forward to it, but it’ll be nice to have it off my plate, and nice to have a pair of July socks happen even though I spent the month spinning. What a great spin! 6 oz. of camel/merino/silk blend from BMFA. It’s gorgeous stuff, and I decided to mix up the colors really well. 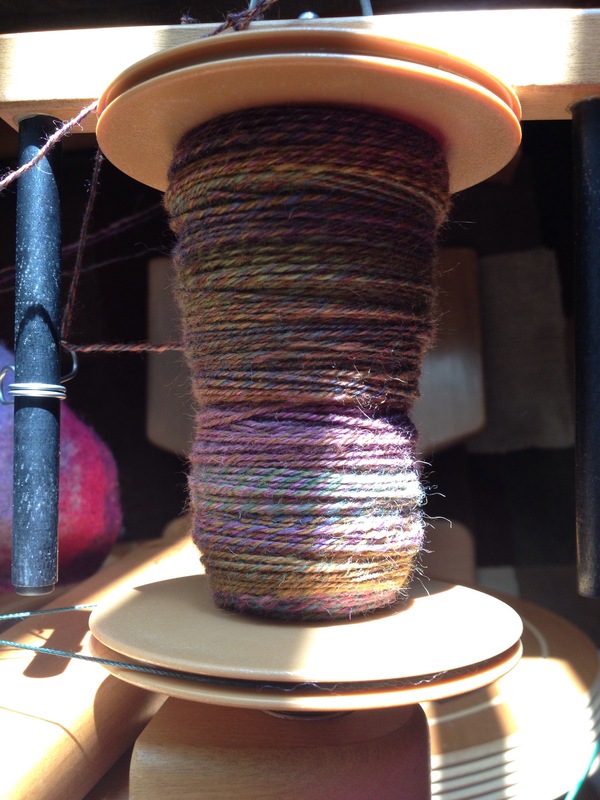 I spun the singles extremely thin, so that I have a 3 ply laceweight now. 620 yards. It’s really quite gorgeous! I was going to take today as my only rest day, since I didn’t take the others even though we were so busy during the tour. After all, 3 new skeins of handspun during a very busy time while I haven’t been overly inspired about crafting? It’s a total win no matter what. But, I tossed my fiber stash and reorganized. And then decided I needed to start something new anyhow. This is, again, BMFA. 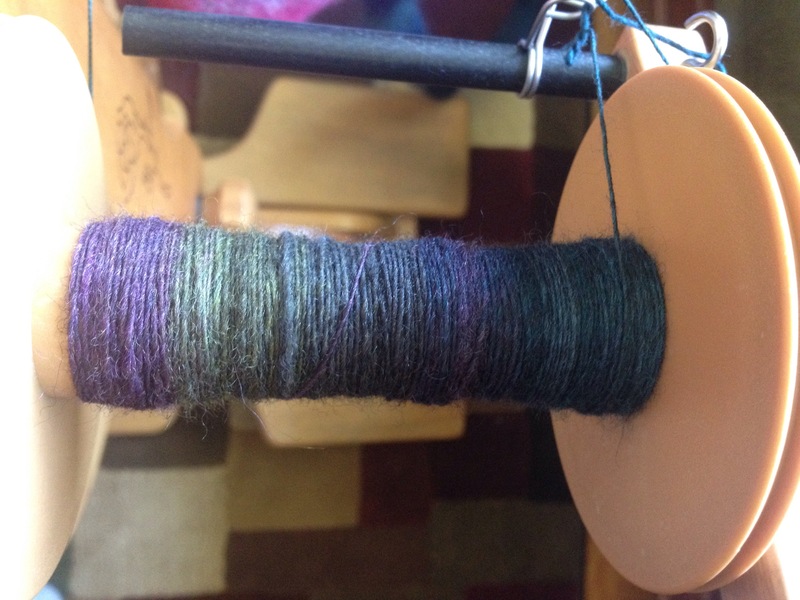 It’s 4 oz of black BFL and a little over 3 oz of merino/silk. Same colorway. I thought I should spin them and then ply them together, but the more I thought about it, the more I realized that it might be even more fun to spin them separately and then knit them together. So I decided to start with the BFL. I put a larger whorl on so I couldn’t spin so thin this time around, and of course that makes the project feel like it is flying already. But, today is a day if motorbike riding. Not much more spinning will be had. And I can’t wait! One of the things that most attracted me to Mr. Ink originally was how he always seemed to be trying to live the best possible life, in the present, with the resources he has. It matched how I try to go about life, and since our best lives matched, it makes for a very connected couple. This year, thus far, we have not been living our best lives. We’ve been living the lives we had to in the circumstances, and doing what needed to be done. But, it hasn’t been our best lives. So, this weekend commenced with the albatross gone, and it really feels like we are back to our best lives. Last night we made chimichangas, rice and beans, and margaritas. We hung out and enjoyed each other’s company and had a grand old time. This morning we puttered around the house, took the dog on a walk through the neighborhood, and went over to a local trail for a mountain bike ride. It began pouring on us, so we were unable to complete the ride. But we still felt like we were enjoying our best lives again, and that was SUCH a relief. The rest of the weekend is more of the same. Enjoying our home together, enjoying our activities, and doing that which we love to do. In my spare moments at home, I’ve been plying. I’ve got my first bobbin done, and it looks great! Now on to the next bit. Hopefully I’ll get this done today, when Mr. Ink is working on one of the motorcycles. I might even drag the wheel into the garage for a bit and hang out there. The yard needs some attention as well, I hope to do some of that tomorrow morning. 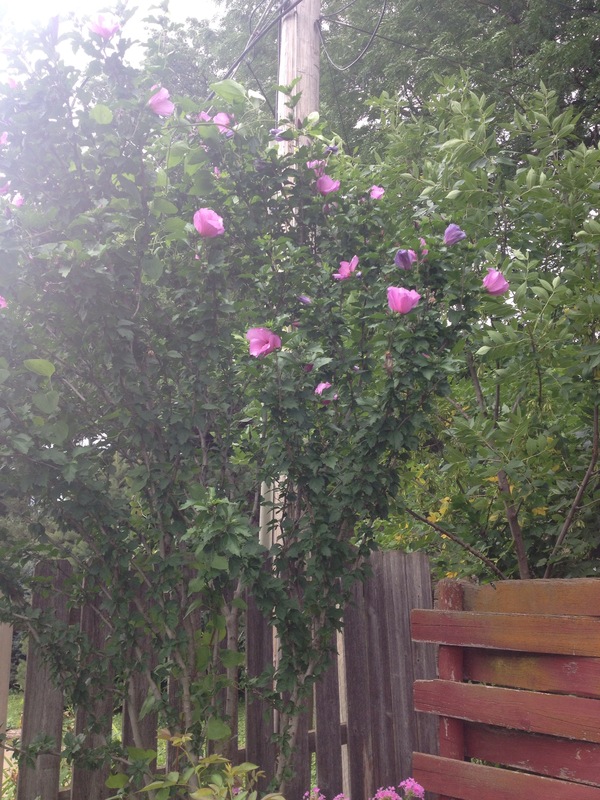 However, our very large and well established rose of sharon is blooming. So beautiful! I think I need to try for a better picture later on. Hard to get a photo of blooms that are happening well over your head! Mr. Ink came home last night and said “I want to relax tonight!” I was secretly joyful, as we had already purchased tickets to go see some live music, but I wasn’t sure I was feeling it. Turns out, his form of relaxing was cooking a lovely fish dinner and then going out to see live music. But of course! 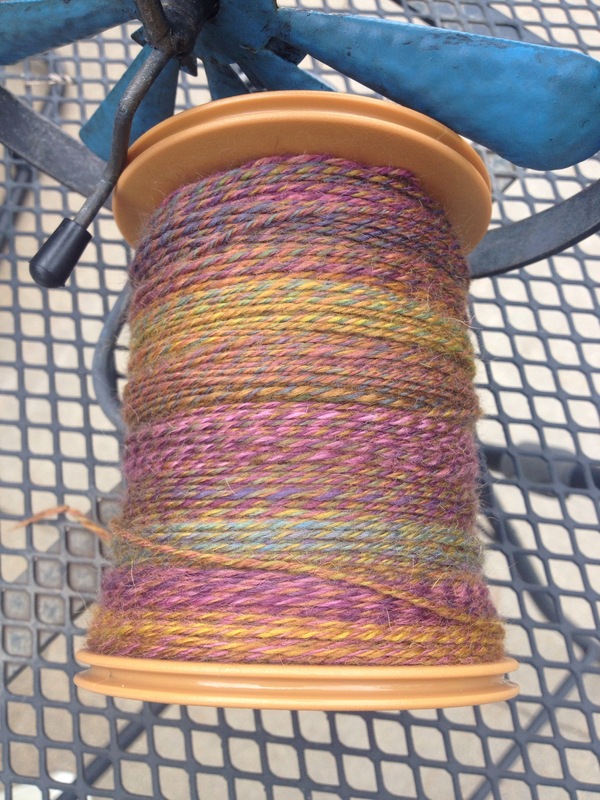 Thankfully, before all of that, I had a little down time to work on some of my plying project. Since it’s a large one, I am trying not to get too frustrated with the pace. 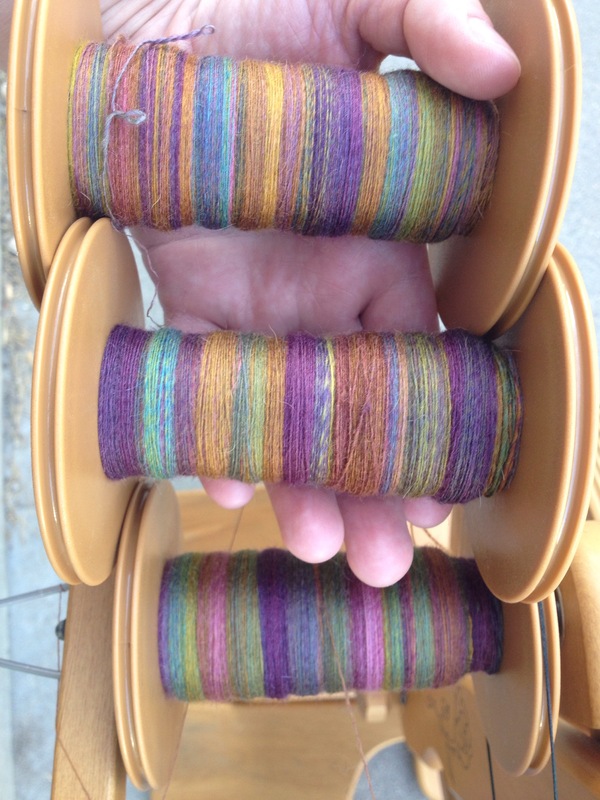 Plus, it just takes longer to ply very thin singles. It’s still looking good though! Because I’ve been plying, I had to pull out another project for my spindles at work. With only a few days left to the tour, I doubt these will get done. But, I am maintaining my desire to ONLY spin during the tour, no knitting. 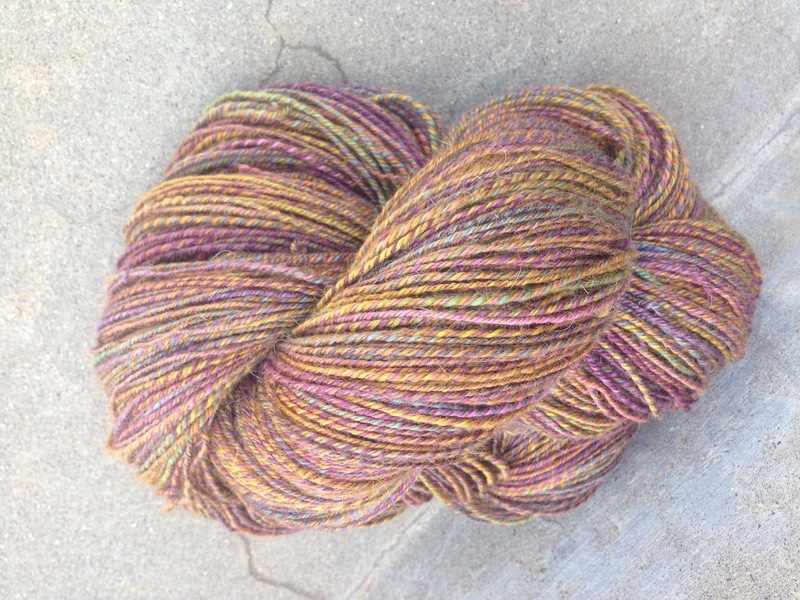 The fiber is dyeabolical’s Flower Shop Inferno, on a BFL/Firestar base. I’ll tell you what, this is one of my favorite bases, and this is the last bump I have on that base. It was tough to decide that I should spin it. 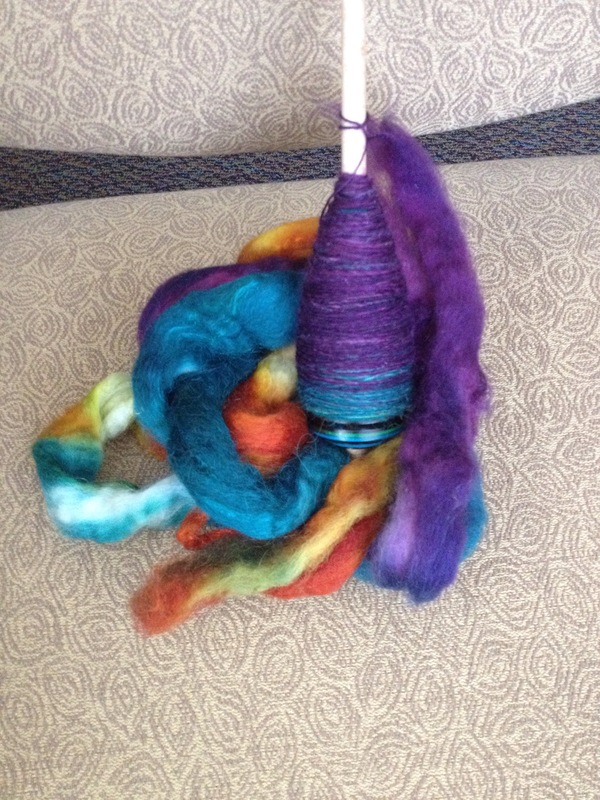 However, surprising as it may seem, I don’t really have all that much left in my stash that is spindle spinning appropriate. Unless you count all of my undyed stuff, and I don’t because that’s just too boring a project during TdF. I am thinking this one will be a 2 ply. 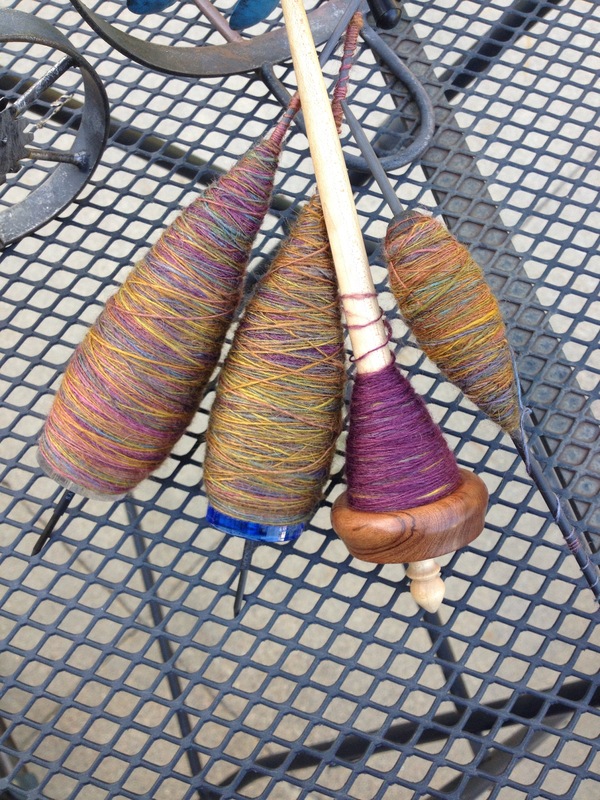 I am enjoying spinning it quite a bit thicker than these previous two projects. It’ll feel like I am flying through it I bet. 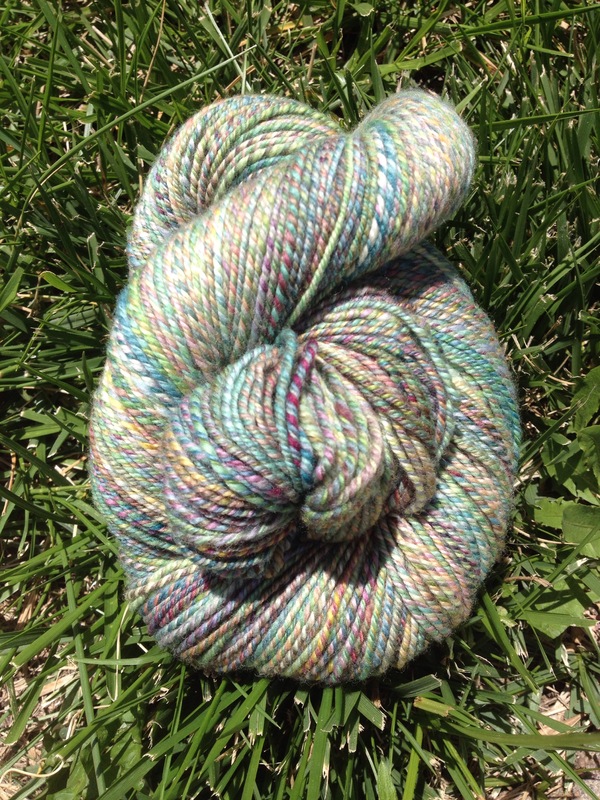 BTW, dyeabolical is having a sale on dyed to order yarns and fibers, in case you want to add to your beautiful stash! Mr. Ink’s old house has been sold. For $7K more than listing price, cash offer. That’s really about as good as it’s going to get, and it means we can get out from under that house very quickly now. Mr. Ink picked up the last few things that needed to be taken out of the house yesterday, old batteries for recycling, and things we didn’t want to leave the new owners with. So, we actually do not ever have to go back there. It is done. 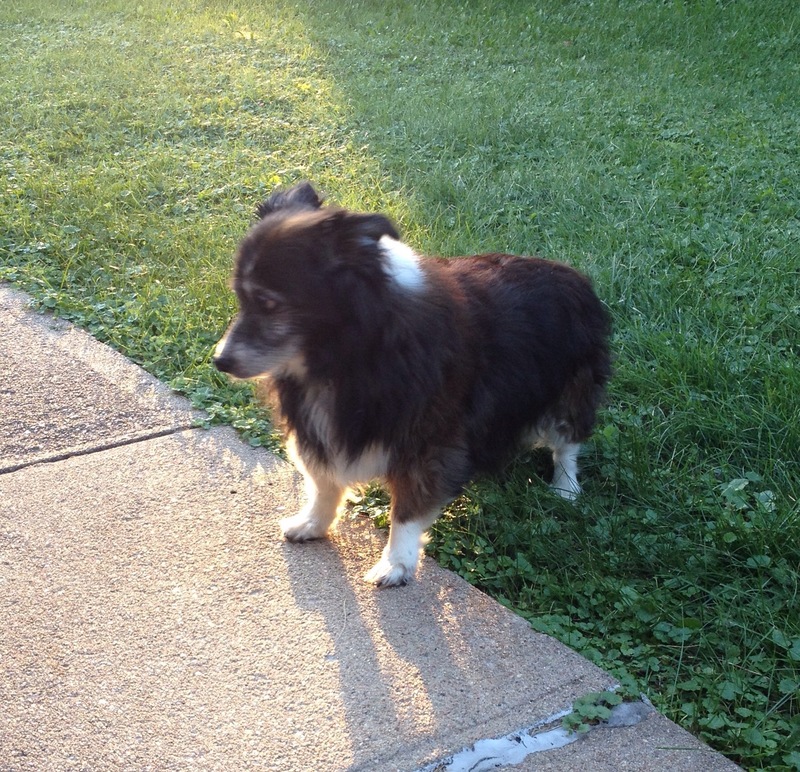 In other wonderful news, our little elderly dog bounced for his supper last evening. And in fact, he ate both suppers. He was also super affectionate, and wanted to be where the people were. It’s so good to see him truly feeling better. All better. And, I seem to be reclaiming my life. If anything, this summer will go down in my memory as the summer we didn’t get to participate in. Mr. Ink and I both are active people with tons of various adventures happening on a regular basis. But, with so much hanging over our heads, we were unable to participate in life as we generally would. I partly think that it feels like we lost out on our summer, but I also try to remember that we did get to do a couple fun things, we took care of our responsibilities, and we had the opportunity to spend time with various family members while working on the old house. It’s not a loss, but we’ll be eager to get back to planning and enjoying next year. In the meantime, I finished the singles I was working on last evening as I sat outside enjoying the patio and the backyard. 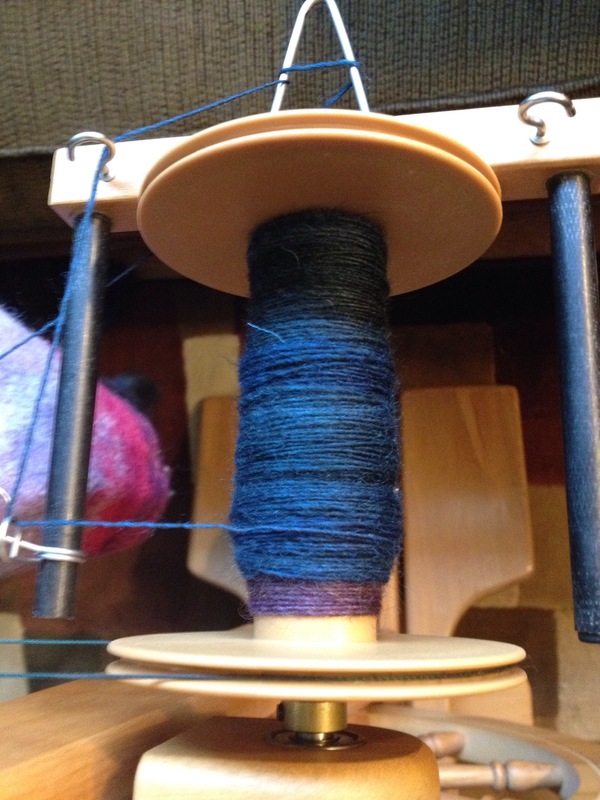 It was about the time we were to meet with our agents to hear the house offers, so I had to stop there, but I did get a very small start on plying late last night. It’s 6 oz. of singles so it’s likely to take me FOREVER to finish. But, I am absolutely thrilled to have it started and in a place I can just sit with it every now and then and make a little progress. I’ve got no new spinning of note for you. I did a bit last night, but really not much. First a quick house update. We had 6 showings on Monday, 8 on Tuesday, and 6 scheduled already for today. Tonight we get to hear all the offers at once, and I am quite excited about that. Since I have no spinning update, I figured I’d give you a quick dog update. 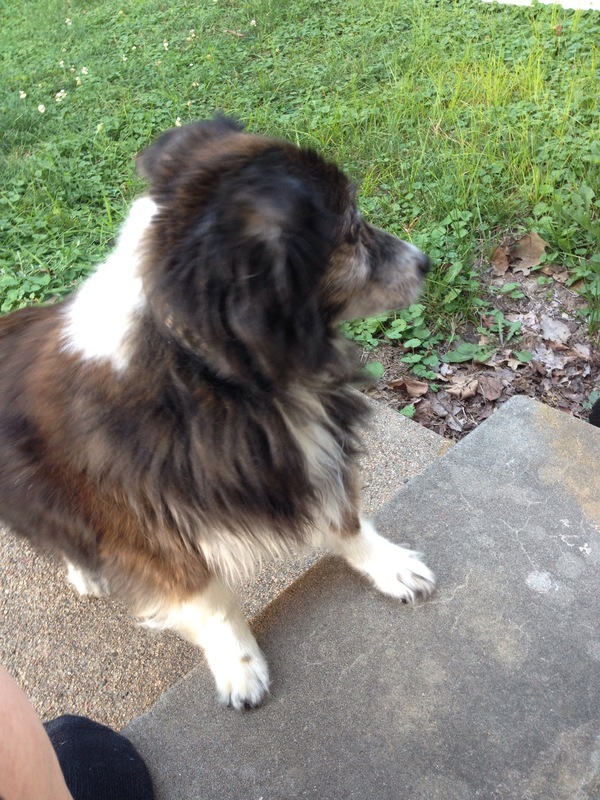 Over a week ago, our 17 year old dog came down with an infection and pancreatitis. At the age of 17, it seemed unlikely to me, right from the start, that he would pull through this one. As the days wore on, it seemed less and less likely that he could heal. He refused any and all food for 4 days, and was clearly quite miserable. Trying to get his pills in him required trickery and force, which didn’t make us feel very good, and made him suspicious of us. And even then, he’d often manage to chipmunk them and we’d find them on the floor later. In the midst of all this, we were spending all our time cleaning out the old house and dealing with everything that went along with getting it on the market. So, we were pushed to our limits emotionally and physically. On Sunday evening, our sister in law ordered a huge meal of indian food, and we spread it out on the dining room table to feast. And that little dog suddenly had interest in food. He wandered over to the table, and acted like he wanted to eat. So, Mr. Ink gave him a piece of tandoori chicken. And he ate it! Pretty sure we all cheered! He ate another piece, and that was it. But it was encouragement. On Monday evening, it was 4 pieces of chicken. Tuesday, it was 6 pieces of chicken, and a little bit of meatloaf. And then he’d even chew up his chicken, then spit it back out. As if he wanted to enjoy it, but no more would work. Today, by lunchtime, he’d already finished up his leftover chicken and ate a dog biscuit, the first dog oriented food he’s had in over a week. What a very good sign! He’s upright and looking much better! He started this illness at 28 pounds, which is pretty good. I was worried he’d have really dropped drastically, but I weighed him last night and he was at 27, not too shabby. I didn’t grow up with dogs in my life, and haven’t tended to like them much as an adult. But this guy? He’s so sweet, so gentle, so quiet, and so funny. 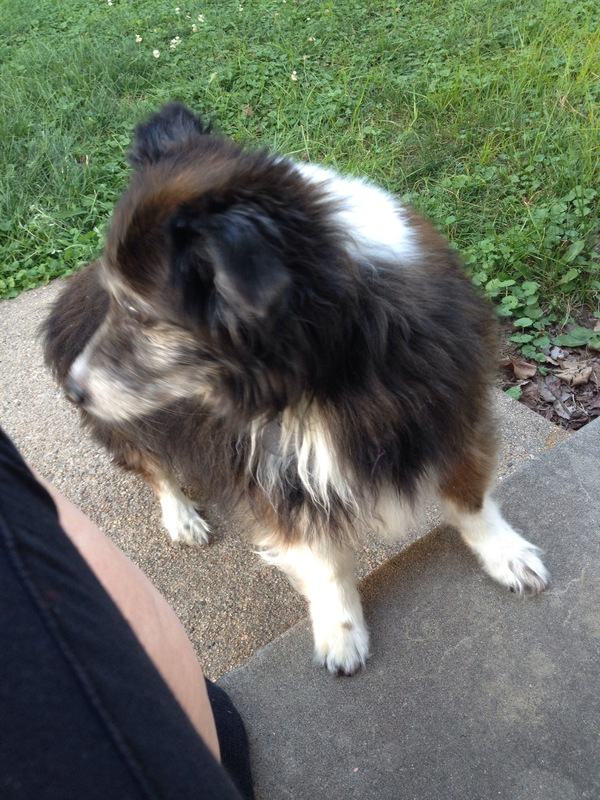 I used to empathize with dog owners in the loss of their dog, but I didn’t really get it. I get it now. The knowledge that this little guy won’t be around forever is gutting. But, I am just absolutely thrilled that we get a little more time with him, and that really feels like a bonus. So, between the dog being sick, and the clean out of the old house, it started to feel like my life was a pressure cooker, and the pressure just kept building. But, with the house on the market, and the dog finally improving a bit, someone let the steam out. The great news is that the house had 5 showings yesterday and has 7 scheduled today! Last evening I decided what we really needed was a night off from life. Yes, we’ve still got obligations. Yes, the lawn needs to be mowed. But, instead we did the things that we like to do together. We made a nice dinner, and I got the vacuuming and laundry done while Mr. Ink went grocery shopping. 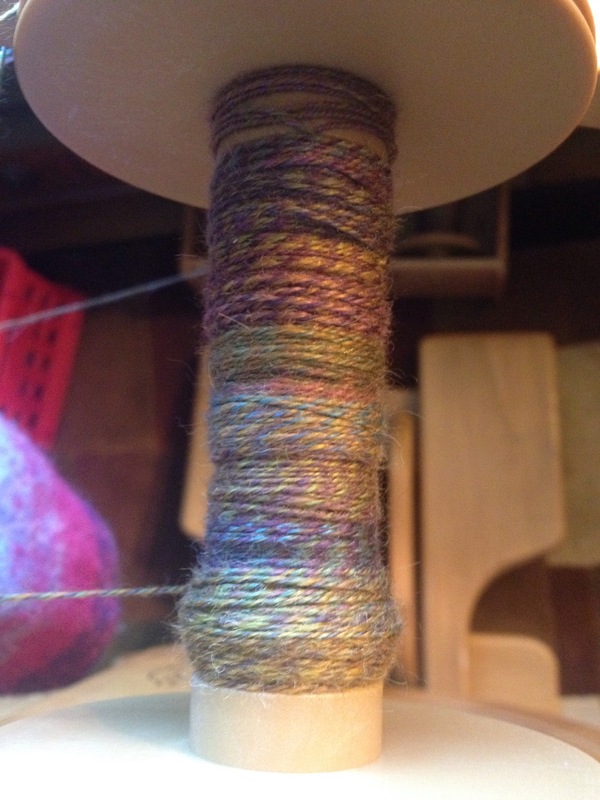 I did a tiny bit of spinning, but it was minimal, as spinning has been since Friday. So, since there hasn’t been much of an update, and I am only working on one project, I figured I’d post where I am on that project. In all honesty, there’s not much left. I’ll be plying by the weekend for certain. However, I suspect this will be my last TdF yarn. I might start another, but I don’t see it being completed before the end of the tour.